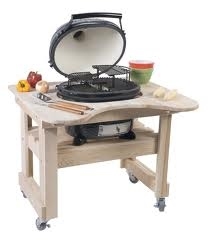 MeMe Marketplace is proud to carry Primo grills - the only ceramic grill made in the USA. Food cooked on this ceramic grill is, let's just say, mind-numbingly good. From the first lift of the lid, the heft of the Primo grill leaves its impression on you, and therein lies the secret - perfect concentration of heat means a juice-filled, tender, perfectly cooked piece of meat. Then again, once you discover how versatile a Primo is, you won't be using it to cook just meat. 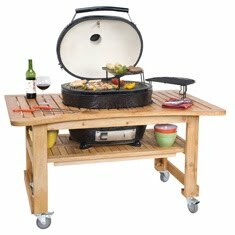 Pair this grill with one of our varieties of lump hardwood charcoal and experience grilling how it was meant to be experienced. Oval XL - The patented Primo Oval XL features 400 sq. in. of standard cooking surface (expandable to 680 sq. in. w/ rack extensions), cast iron chimney cap, easy to read thermometer, stainless steel lower vents and ceramic shoes. Oval Junior - The ceramic grill for those with size and space in mind. Features 210 sq. in. of standard cooking surface (expandable to 360 sq. in. w/ rack extensions), and all the standard Primo features found in the XL.